Looking for the biggest and funnest free way to ring in the new year? Head to downtown Los Angeles for the the third annual Grand Park + The Music Center’s N.Y.E.L.A. For 2015 the free event is taking up even more space, now covering total of 90 acres across Grand Park, The Music Center Plaza, and adjacent city streets in DTLA. 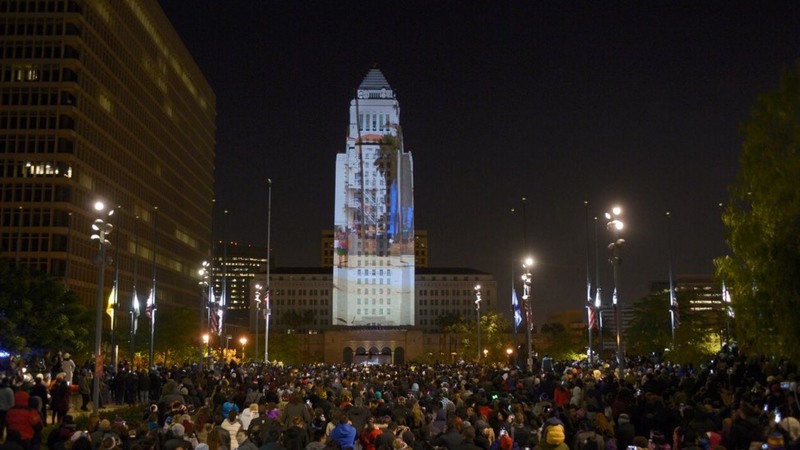 Guests of the public celebration will be treated to live musical performances and visual art installations, 3D animated projections on two sides and 22 stories of the iconic City Hall building, plus interconnected, animated light projections on the surfaces of the Hall of Records building and The Music Center’s Dorothy Chandler Pavilion. Organizers are expecting some 50,000 people to attend. Public countdown starts at 11:55pm. Food and non-alcoholic beverages will be on sale throughout the event grounds. Guests are strongly encouraged to take public transit to arrive for the celebration. You can view a full outline of street closures and times via this community letter sound out by Grand Park. For more information, including restrictions on what you can/can’t bring into the festivities, visit the official event page on Grand Park’s website.